Dr. Sebastian is genuinely concerned with your health and well being. 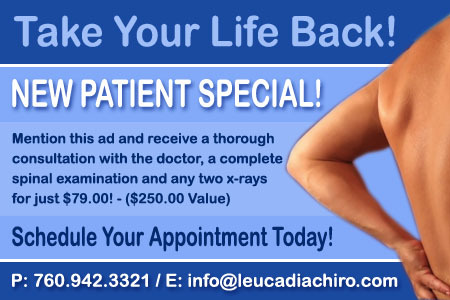 People seeking treatment at Leucadia Chiropractic are assured of receiving only the finest quality care in a friendly, warm and compassionate environment. We invite you and your family to come and experience holistic health care at its best! 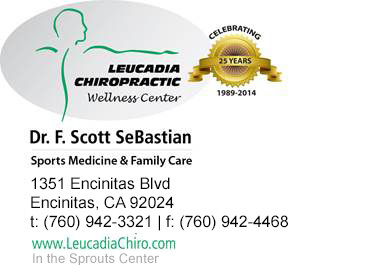 Dr. Sebastian 's goal is to make San Diego, North county, and Encinitas a healthier place by providing all of the important services of a chiropractor and holistic health care practitioner. The finest chiropractic, massage therapy, acupuncture, vitamin therapy, homeopathy, homeopathic remedies and exercise therapy is offered. Please check out our website, and then call for an appointment. For Encinitas, Del Mar, Carlsbad, Solana Beach North County, San Diego, and Cardiff, there's no better choice for natural health care. You came to the right place! Our Encinitas chiropractor wants to help you rise to a new level of health! Dr. Sebastian can bring out the best in you- whether you are looking for relief from pain, optimal body function, or excellent performance! Located in the heart of Encinitas, CA 93312. Our Encinitas chiropractic center’s top priority is dedicating time and effort to help you achieve your health and wellness objectives. Dr. Sebastian combines skill and proficient knowledge in order to help patients of all walks of life accomplish their most ideal physical and mental health. 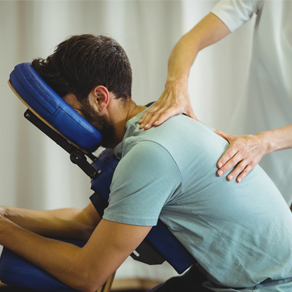 At our Encinitas chiropractic center, we are here to accurately and efficiently determine if chiropractic care can help the health problems you may be experiencing. Dr. Sebastian can help patients of all ages, from infants all the way up to the elderly! It doesn’t matter how old or young you are- if you need relief from pain, stop the suffering and make an appointment with us today! How does an Encinitas chiropractor help? We need healthy bodies to live a satisfying and productive life. We need to be healthy for ourselves, our loved ones and our children. A Encinitas chiropractor helps with creating a healthy nervous system which is a major key to your health on a daily basis. Chiropractic is the largest alternative health profession in North America and the third largest health-care profession in the United States. Your muscles and nerves work together to keep you healthy. When neuromuscular block impedes the flow of nerve communication, the result is tension. A skilled Encinitas chiropractor finds the blocks in your nervous system, therefore restoring your health and longevity. No pregnancy pain with Chiropractic! Headaches and Low Back Pain Cured! Torn Quad and still won Triathlon! "Dr. Scott is an outstanding & amazing chiropractor ! His tremendous experience and expertise as a doctor has continuously healed thousands of patients. He & his staff are also very knowledgeable in the cutting edge of technology.. As a patient of him, I am so confident to be under his care. Dr. Scott with his efficient & friendly staff run a great clinic ! With no qualms in my mind, I would recommend them with the highest esteem. They are a real asset in the community !!" "The monthly massage package is the best thing I ever did for my body! All the staff is amazing and the massage is the best I have found in North County."